Over 700 longboats left Norway that year. Eventually, 350 Longboat's and there crews decided to stay in the North of Scotland. Rollo and his men sailed south. He knew there were greener lands further to the south. They sacked the French town of Rouen and sailed on up the river till they neared Paris where they found stiff resistance from the French Army. ​Rather than lose men, Rollo withdraws; knowing their prospect back downstream would be better. They found an ideal riverside base between the coast and Paris. High mountains either side of the river. The new King, Phillip III, knew that force was not the answer to the problem. Weighing up the costs of all French losses from these Norse raiders. He decided to tempt them out. ​The Red square below donates the land Yarl Lassy, and his kinfolk were to settle and start a new life. In turn, Lassy gave Manors and farms to all who had sailed with him. William, the Duke of Normandy, had been promised the Throne of England by the childless Edward the Confessor, his first cousin once removed. However, on Edwards death, the Throne of England was taken by ​the powerful English Earl Harold Godwinson. William was determined to go to war to gain what he thought was due to him. 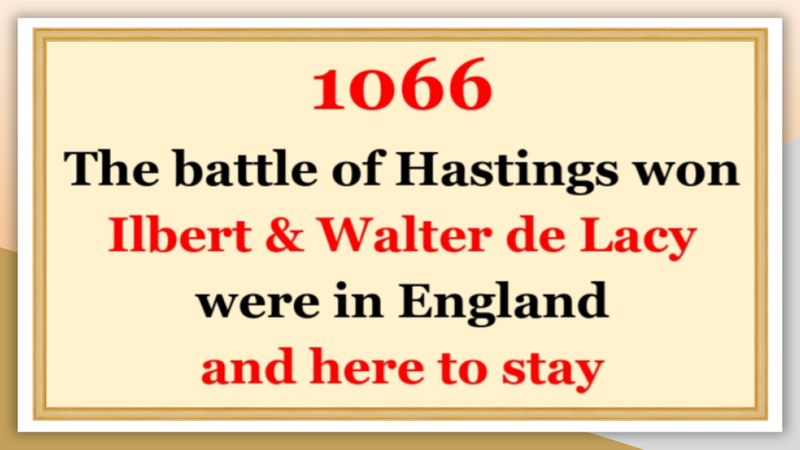 ​Walter de Lacy and his son Roger led their men to the centre of the action, the heart of the hand to hand fighting. Ilbert de Lacy led his cavalry in charge after charge on the flanks of the battle. Follow the outcome of the battle on this amusing animated video version of the Bayeux Tapestry.